I finished The Age of Miracles by Karen Thompson Walker this evening, after poring over every word, reading and rereading every line in it. I'm not really sure how to even begin talking about it besides telling all of you to read it- to just go get it, to go pick up this novel that is somehow more like a long poem, page after page. 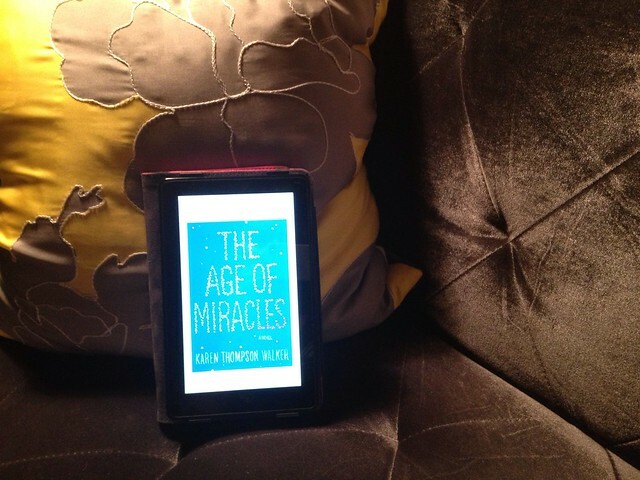 The Age of Miracles is fiction, although I feel like it could be real, which is strange and scary all at once. Without giving too much away I will say that it is about our world right now gone wrong- how a "slowing" of the Earth's rotation suddenly happens, and it's about what happens next. The writing is beautiful, pages full of the sharpest imagery and words that just click together like they were meant to be written precisely in that way. There are many stories in one- the Earth's story, a family's story, a growing up story that reminds me a lot of my own sometimes awkward adolesence, and a love story...a beautiful, touching story that brought me back to being 11-years old myself, falling in love with the boy on the skateboard. This is a special book, a book for adult fiction lovers, YA fiction lovers, Sci-Fi lovers....anyone who loves good read. It made me laugh and cry, and I found myself squeezing in 5 minutes, 10 minutes of reading whenever I could. Just watch this trailer for the book, then get yourself a copy...and let me know what you think.